IMPORTANT: Make sure you have set up Phabricator and set up Arcanist before proceeding! While some developers use bookmarks/etc to track changes, for this this guide we will use just repository heads: no bookmarks or labels. This essentially means “just start coding off tip and commit”. The hg wip alias provides a view of the repository that allows for keeping track of the work. For this example we will craft one change for review. When we get feedback that changes are required we will amend our commit in-place. Let’s start with a clean checkout. When we write the commit message we should follow the Firefox source tree’s common commit message format. We will include a Bug ID and list of reviewers. See the committing rules for more information about proper commit message formatting. You are allowed to skip the bug number and reviewer names if you don’t have them yet, but the Lando automated landing system, used later in this walk-through, will insist that you add them before the code can be landed. Before we request a review we should check for changes upstream. The moz-phab command will take care of creating a code review for us. It will automatically link the review to the BMO bug as well as notifying the reviewers. When it’s time to address feedback we use hg amend. hg commit --amend also works, and allows you to update the commit description while amending the commit. Check off the Done item in the Phabricator UI. Now run moz-phab a second time. 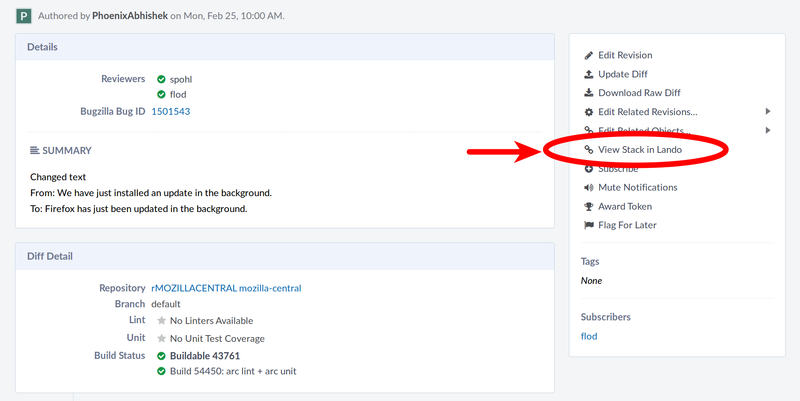 Phabricator will automatically submit your Done items in the UI and notify your reviewers that you have made updates. Everything looks good: the reviewers have approved our changes. Let’s land our changes. You will be taken to the Lando revision overview page. Press “Preview Landing” and give the change one last review: double-check the commit message, etc., before hitting the “Land” button. Hit the “Land” button and Lando will automatically land your changes. moz-phab has other features including the ability to update and land entire stacks of related commits. Check out the Submitting Patches section for more information.